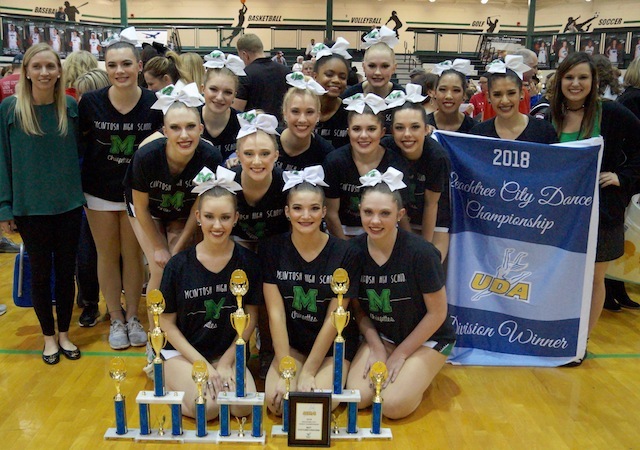 For the ninth consecutive year, the McIntosh High School Chiefettes have taken the state title in small varsity pom after competing in the championships in Peachtree City under the direction of head coach Carmen Yarbrough, assistant coach Adrienne Scasny and technique instructor Erica Keating. Also taking top honors were freshman Meghan Hays (junior solo division state champion) junior Caroline Malloy (third place, teen solo division). Bridgette Machemehl, Jolie Fouts and Joslyn Nicosia placed seventh, fifth and fourth respectively in the senior solo division. The Chiefettes took second in the jazz dance competition and brought home the award for best costume. Front row, from left: Jolie Fouts (co-captain), Joslyn Nicosia (co-captain) and Bridgette Machemehl. Middle row: Jordan Nelson, Caroline Malloy, Meghan Hays, Destine Hebert and Kate Strickland. Top row: Carmen Yarbrough, Ally Cullen, Elizabeth Raymer, Dominique Savain, Madee Link, Natalie Marshall, Fernanda DeLaMora and Adrienne Scasny.